My subject today is structured piano practice – many of you have asked for a blog post on this topic. It’s so easy to sit down at the piano and play without much thought or adherence to any real practising schedule. There is nothing wrong with this and we all do it at some point. However, it’s a good idea to incorporate some kind of structure into your practice regime. It will allow you to make sure you are working at the necessary aspects of your playing every week as well as giving you some spare time at the end of each session to enjoy yourself and revisit past pieces. If you are more advanced you may like to practice some Hanon finger excerises or Czerny Studies; The School of Velocity or 101 Daily Exercises by Czerny are all excellent choices. 2. Then focus on some technical work or scales and arpeggios for 5 minutes. 3. Spend 10 minutes practising your assigned pieces for the week; work at them purposefully and slowly, separate hands at first. Use a metronome or try to develop a feel for keeping the pulse or beat – count out loud if necessary. 4. Now spend maybe 3 -5 minutes reviewing past pieces. It’s always a good idea to go over old pieces reminding yourself of what you have already learned and to build up a little repertoire of pieces. 5. 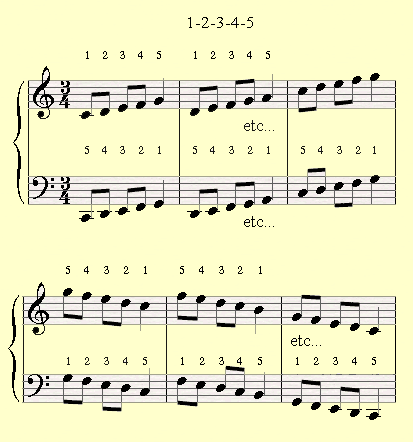 If you can spare a little more time then try to do a couple of sight reading exercises. You just need to look at two short passages; look through them noting all their features then play them slowly forcing yourself to keep going in time until the end. Your sight reading will improve no end if you do this regularly. Try implementing this little action plan. Of course, it will differ depending on your level and on what you need to learn, but try to apply this kind of thinking to your practice schedule. Do let me know how you get on – I love and appreciate your feedback.